14. SYMPHONIA L. f., Suppl. Pl. 49, 302. 1781 . Trees, glabrous; latex bright yellow. Leaves opposite, with well-developed intersecondary and tertiary veins subparallel to secondaries. Inflorescences terminal or axillary, few-flowered, often condensed cymes, or flowers solitary. Flowers bisexual. Sepals 5, quincuncial; petals 5, contorted. Stamens in 5 fascicles of 3 stamens each; filaments smooth, connate; anthers long, connective glandular. Ovary 5-locular, few ovules per carpel; styles 5-radiate, pores at the ends of the branches. Fruit a leathery berry. Seeds 1-few, large; testa apparently hairy; cotyledons minute. Neotropics, Africa, Madagascar; ca. 22 species, 1 in Venezuela. Symphonia was erroneously included in part of the description of Moronobea coccinea Aubl. (Histoire des Plantes de la Guiane FranÁaise ( 778, fig. 313, a-j only, 1775). 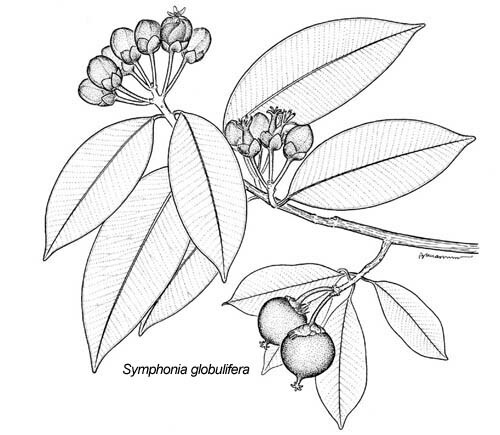 Symphonia globulifera L.f., Suppl. Pl. 49, 302, fig. 9. 1781 . -Chuchuy, Mani, Ojoru, Ojuru, Paramán, Peramán, Peramancillo. Symphonia microphylla R.E. Schult., Bot. Mus. Leafl. Harvard Univ. 17: 20. 1955. Symphonia utilissima R.E. Schult., Bot. Mus. Leafl. Harvard Univ. 17: 22. 1955. Tree to 35 m tall. Lowland to montane evergreen forests, a dominant component of the lower and middle Orinoco Delta swamp forests and palm forests, 0-1700 m; widespread in Delta Amacuro, Bolívar, and Amazonas. Anzoátegui, Apure, Monagas, Sucre; widespread in tropical America, Africa, and Madagascar. Fig. 224. Symphonia globulifera varies in the size, texture, and form of the leaves and in the size of flowers and inflorescences, none of which appear to be correlated with geography or ecological situation. The resinous latex has been used medicinally by indigenous peoples. Boiling and drying the sap produces a wax used in tool manufacture and maintenance. The sap has also been used by Piaroa Amerindians (among many others) to caulk canoes and as a general-purpose glue. As it burns without smoke or odor, the resinous exudate is burned as a source of light. The fruits are dispersed by bats, and the flowers are pollinated by hummingbirds.